Children are at greater risk from pesticide exposure than adults because they play closer to the ground and their bodies are still developing. Cosmetic pesticides can be inhaled, absorbed through the skin, or be swallowed when children place contaminated objects and their hands and in their mouths. Don’t forget about our pets too! There is a growing body of evidence linking pesticide exposure with certain types of cancer, including childhood leukemia and childhood brain cancer. Cosmetic pesticides are used to make lawns, gardens and other green spaces look better. We call them ‘cosmetic’ because some think they improve the appearance of lawns and gardens. Regardless, they are not needed for health and safety. Safe and effective alternatives exist. Your family can be indirectly exposed even if you do not use cosmetic pesticides. If sprayed, cosmetic pesticides can drift through the environment and mix with the air, soil, or water. Pesticides may even collect on plants & objects we don’t intend to spray. We’re asking all political parties to support banning the use, sale and retail display of cosmetic pesticides used on public and private lands – something only the provincial government has the power to do. How can you help? Spread the word, share this blog post with your friends, email BC’s party leaders and find out what they’re doing to help ban the use and sale of cosmetic pesticides. In a special op-ed to the Sun, Carolyn Tuckwell, president and CEO of the Boys and Girls Clubs of South Coast BC, explores the results of Canadian kids self-reporting in the UNICEF Child Well-Being in Rich Countries report. APRIL 25, 2013: Check out this article on Rabble.ca by DERRICK O’KEEFE, including a response from First Call Provincial Coordinator Adrienne Montani about the NDP’s campaign promise around welfare rates. Check out this great Op Ed in the Vancouver Sun about the need for a poverty reduction strategy to support health outcomes by Dr. Marjorie MacDonald, president, Public Health Association of BC; Scott McDonald, chairman, BC Healthy Living Alliance; and Dr. Victoria Lee, chairwoman, Health Officers Council of British Columbia. There is a devastating health condition that affects one in 10 children in our province: 87,000 children. It causes injury, illness, school failure and premature death. As a society, we must decide if it is a health condition we want to treat. THE B.C. LIBERALS’ promises on childcare won’t make much of a dent in the shortage of spaces, according to Sharon Gregson. “They’re still only talking about 2,000 new spaces over three years, which won’t even begin to address the need in the city of Surrey, never mind the whole province,” Gregson, spokesperson for the Coalition of Child Care Advocates of B.C., told the Georgia Straightin a phone interview. Who Says BC’s Election Is a Bore? There’s plenty at stake, say 18 groups who shared their agendas with The Tyee. Add your voice! As the writ is signed heralding the start of the provincial election period in British Columbia, some are calling this a less than exciting contest given the sizeable lead held by the NDP. There’s more than one way to measure political buzz, though. The prospect of a new government has many groups elbowing each other aside to state their agendas and get candidates on the record before voting day. The Tyee asked organizations around the province to tell us what in their view is at stake in this contest. Answers flowed in from environmental organizations, business councils, public interest advocates and more. Below are the responses we received. But before we get to them, a request. We encourage you to join those voices, posting a comment at the end of this article explaining why the outcome of this election matters to you. Sadly, Kim Campbell, Canada’s only female prime minister, was right about one thing: Elections are not a time when politicians want to engage in serious debate. But they’re supposed to be. They are supposed to be an opportunity to ask the local candidates where they and their parties stand. They are supposed to be a chance for citizens to put issues on the public agenda rather than just being buoyed along by party agendas. And elections are supposed to provide a chance to challenge and question candidates seeking our support before we make our final decisions. Of course, politicians try to duck and weave rather than say something that will “cost” them at the polls. But that doesn’t mean we should quit asking hard questions. Child poverty remains a serious and lingering issue in B.C., and Canadian Federation of University Women is working to make that issue a priority with voters leading up to the May provincial election. The CFUW is organizing talks on child poverty across the province this month, and the Victoria chapter is hosting a forum next Wednesday at the Salvation Army Citadel in Saanich. 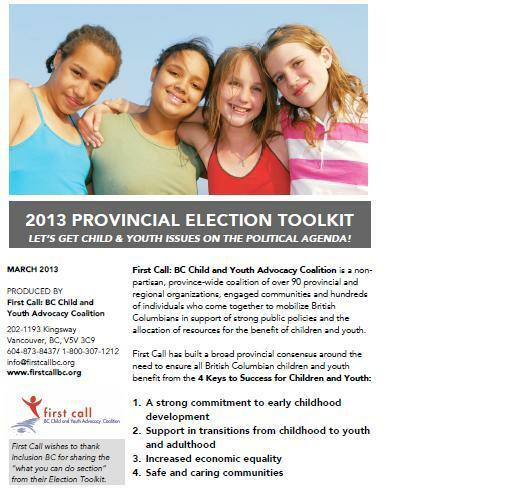 Leslie points to the 2012 Child Poverty Report Card by First Call – B.C. Child and Youth Advocacy Coalition. That report assessed that B.C. is “at the bottom of the heap” in terms of most poverty measurements: a child poverty rate at 14. 3 per cent, the worst in Canada except for Manitoba; and the worst poverty rate for kids living with two parents. THREE B.C. HUMAN rights organizations are urging the province’s political leaders to commit to changing a policy they say is affecting some of the most vulnerable children in the province. In a letter addressed to Premier Christy Clark, NDP Leader Adrian Dix, Green Party leader Jane Sterk, and B.C. Conservative leader John Cummins, the organizations First Call, Community Legal Assistance Society, and West Coast LEAF are asking for a commitment to end the current clawback of all child-support payments from families on income assistance. “We think that’s a great inequity, and unfair, and given how low welfare rates are, it really compromises children’s health and well-being to deprive them of that,” Adrienne Montani, provincial coordinator for First Call: B.C. Child and Youth Advocacy Coalition, told the Straight by phone.